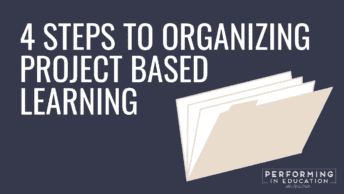 Whether you’re a frequent user of project-based learning or a newbie, you know there are a lot of different parts to it. One of the parts that I think often gets left behind is the driving question. The driving question is the question you pose to students in order to get them to investigate a problem or process. Students will learn or practice key standards while exploring the driving question, but the standards do not need to be stated in it – that’s a separate piece of your lesson. First of all, it’s important to understand what type of questions you’re already asking in your classroom. You will probably ask a variety of directed and open-ended questions throughout the school day. Directed questions are ok to use during a PBL, but your driving question should be an open-ended question. Are based on quick facts. Are necessary, but not appropriate for a project’s driving question. Allow students to approach the question from different viewpoints. Require students to investigate before answering the question. What is the profit when you sell one of the RC cars in your toy store? How do toy store owners get customers to visit their stores? You’ll only need one driving question for your overall project-based learning activity. This question should be open-ended and objective. Driving questions should not be asking students to make something “good” or decide if something is “good” or “bad”. How can I plan a party my friends will want to attend? How can I design a toy store that customers will come spend money at? How can I build a lemonade stand that my neighbors will stop at and buy lemonade from? The question starter can easy be changed to “How can we” if working in groups or as a class. Let’s take a look at a few of my project-based learning activities. Before you read the driving question underneath, try to formulate your own. In this activity, students design a candy store layout with candy of their choosing. They set prices to make a profit. What do you think the driving question will be? My driving question: How do I design a candy store that local customers will come buy candy from? The school carnival project has students use what they know about the length and width of certain rides, food, and game booths to create a carnival layout. Students create a survey to find out which food items will be most popular. Students also compare sizes of the prize options for their games. What do you think the driving question will be? My driving question: How do I plan a school carnival that will raise money for our school? This one is a little tricky because the audience is implied (school carnival). In this project, students choose who they want to bring with them on their camping trip. They use the number of campers to choose tents and plan out campsites. They also plan the activities they will do on their trip and get together ingredients for s’mores. What do you think the driving question will be? My driving question: How do I plan a camping trip that my friends and family will enjoy attending? Refer back to the driving question for each part of your project-based learning. When you ask students about their projects, use the DQ to push them in the right direction. When I see mathematical errors in projects, I often ask a question related to the DQ, such as: If you make a mathematical error when calculating the profit, how will that affect your business? The driving question is also a great way to get students excited about the project, while giving an end goal that will be different for each student. This connects to the theme of project-based learning: giving students a voice and a choice!